Welcome to the first data release from the Catalina Surveys Team. Top News: View ~12,000 RR Lyrae from the Catalina Surveys Data Release 1. The Catalina Surveys consist of the Catalina Sky Survey (CSS) and the Catalina Real-time Transient Survey (CRTS). The research of CSS involves searches for rapidly moving Near Earth Objects (NEOs) whereas that of CRTS involves the detection of stationary optical transients (OTs). Both surveys work collaboratively to extract the maximum scientific return from data from three telescopes operated by CSS. In this same collaborative spirit we are now providing an open-access archival data service. An Aitoff projection of the sky region covered by this release in equatorial coordinates (centered at RA=0h). The colour key gives the number of epochs at each location. Single Region Search Service. 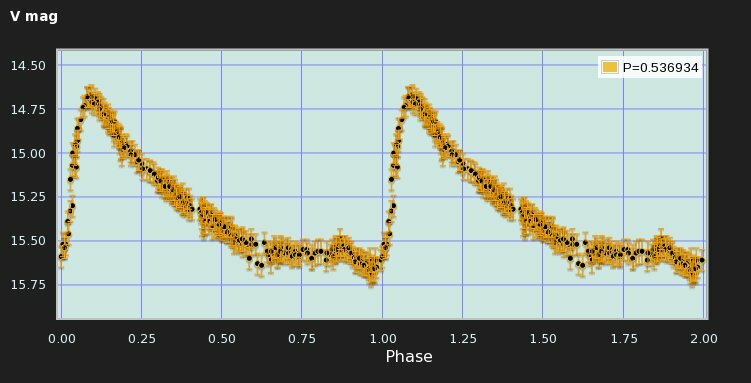 Extract/plot CS photometry. Multiple Object Search Service. Search for a period. Get photometry for a known object. Note: Catalina photometry release covers objects with 12 < V < 20, in the range -30° < Dec < 65° and |b| > ~15° (see FAQ). 2012-11-20: CSDR1 has been updated to include all photometry up to 2012-10-27. 2012-03-28: The CSDR1 photometry now includes improved internal calibration corrections. 2013-01-03: RR Lyrae from CSDR1. clearly identified by Catalina Survey data as an RR Lyrae with a period of ~0.537 days. Links to more examples of Catalina Surveys lightcurves and GCVS variables. Catalina images will be available in a future data release. Organiszation of the data base follows this DB Schemata. What you should understand about the data. This data is supplied with the intent of maximizing scientific utility. Although we have attempted to verify the integtrity of the data, users should be cautious with interpetration of measurements (as outlined in the FAQ). Wherever possible and appropriate, discoveries made using this data should cite the Catalina Surveys ID given by the services. This data is not being supplied by a data center. Therefore, we must limit queries by single users so that all users can benefit. Users wishing to run scripts with very large number of queries, or produce external services linking to the data, must contact us before doing so.